China's refurbished Russian aircraft carrier was snapped at sea in this exclusive image taken by DigitalGlobe's satellite. 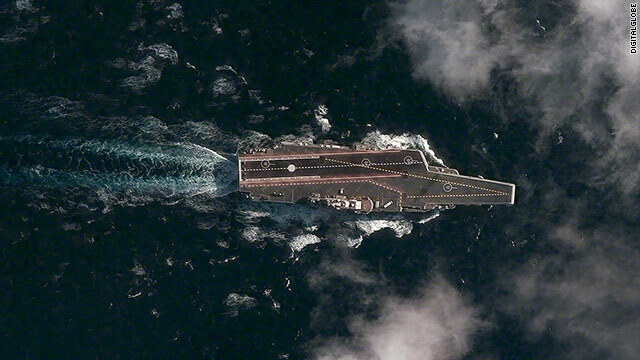 The Varyag aircraft carrier image was grabbed while the carrier was on its second sea trial in the Yellow Sea on December 8, 2011, according to DigitalGlobe Analysis Center. The location is approximately 100 kilometers south-southeast of the port of Dalian. The aircraft carrier is a partially refurbished version of the old Soviet Admiral Kuznetsov Class and was left over from the Cold War. A Macao-based casino group initially arranged for the purchase but ulimately it was taken over by the Chinese military, according to a Stratfor analysis which posits they were likely the original buyer.